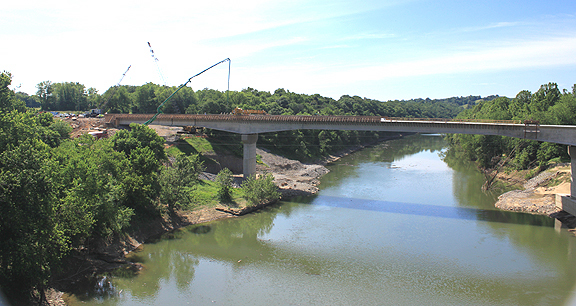 Project obstacles and solutions: The State of Kentucky had planned to replace an aging bridge with a new steel girder bridge over the Kentucky River. The new bridge needed to span a total of 900 feet. The longest segment would be 325 feet over the water between two piers. In studying the plans for the bridge, the State of Kentucky found that by changing the girders to spliced, pre-cast concrete from steel, they could save $800,000 on the project. However, the 325 feet across the water would be the longest span in the US for this type of construction. Janssen & Spaans Engineering was hired to re-engineer the bridge with concrete girders and the Haydon Bridge Company was hired as the general contractor for the project. The re-engineered bridge called for post-tensioned, pre-cast, and pre-stressed, high-strength concrete. Each span had six girder segments and two pier support segments that were cantilevered onto the concrete piers. The largest of these bulb-tee concrete girders measured 135 feet long and 9 feet high. The pier segments ranged in depth from 9 – 16 feet. Prestress Services Industries did the pre-cast work on the girders. The longest girders were floated downriver on a barge while the river was at flood stage due to their overall weight (the longest girders weighed in at 129 tons.) C. J. Mahan Construction lifted and attached the pier segments. Timing on a project of this scope became critical to its success. IMI supplied concrete for the three piers. The piers pours took a total of 1,850 yards of concrete below the deck. Each pier was finished with a decorative form liner and colored with acid stains. The bridge deck and side rails were finished by the Haydon Bridge Company. IMI again supplied 1,700 yards of concrete that was pumped onto the bridge and formed with pavers. Pumping 170 truck loads of concrete required continuous communication from the job site back to the concrete plant. Timing of trucks showing up on the site had to be just in time to keep the process moving along. IMI was constantly monitoring the slump of the concrete, how the mix was working with the pump operations, and checking for consistency from one truck to another. When it was complete, the KY 22 bridge was an engineering marvel and a tax dollar saver for the people of Kentucky. The bridge opened for traffic in December 2010. Photos courtesy of Haydon Bridge Company. Aerial shot by Aerial Innovations of Tennessee.